This is a simple QRSS callsign keyer based on an Atmega AVR programmed in C, the ATtiny13 with 1K of program space and 64 bytes of data memory. I can program this chip and send it to you with your callsign, full or abbreviated e.g. "UPL". If abbreviated then the full callsign is still included in the 12wpm CW ident. There is even space for your locator too! Please see the online shop page, if you want a programmed chip. + Choice of speed 12wpm, 6wpm, QRSS with 1s, 3s, 6s, 10s, 15s or 20s "dits"
To the right, see the pinout of the chip. The basic specifications of the chip such as power consumption, supply voltage etc should be taken to be the same as the ATtiny13 datasheet. Supply voltage range is at least 3-6V. 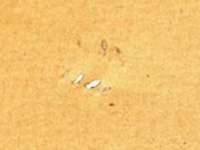 Pin 1 of the IC (top left) is identified by a small dimple in the chip, but I have added a blob of white paint to aid identification. Pin 1 is the "Reset" input to the processor and can be connected to Vcc, or left unconnected. S0, S1 and S2 inputs select the keying speed and should be connected to GND or Vcc as per the table below. On powering up the device, it will start keying your callsign and repeat indefinitely. The table below shows the available keyer speed. I have also produced a version A, which has 50wpm and 60wpm settings suitable for meteor scatter experiments. NOTE: the microcontroller is clocked using the internal 9.6MHz RC oscillator. Being RC based, this is inherently inprecise. This means the actual keying speeds and sidetone could differ by a few percent from the values shown in the table above. Here is the source code, written in C. This is the same code used in the QRSS Kit. Finally here's a picture showing my programmer board and test set-up. I power this off two AA batteries in series (3V). 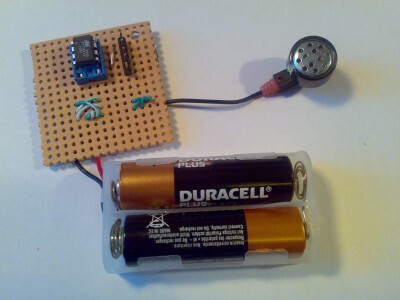 I have connected one earpiece (half a pair of poundland headphones) to pin 2 via a 100-ohm resistor, so that I can hear the sidetone and make sure I've programmed the message correctly. All was not well with my attempts to provide QRSS keyers at low cost to encourage as much QRSS experimenting as possible. Initially I offered these chips at a not-for-profit price of £2, which is about what I estimated it would cost to buy the ATtiny13 chips in low volume, pay the shipping on them, keep a small stock, buy some envelopes and some UK 1st class stamps. Unfortunately, the Royal Mail would disrupt my attempts, and I'm not just talking about the postal strikes due to Pay & Conditions disputes. 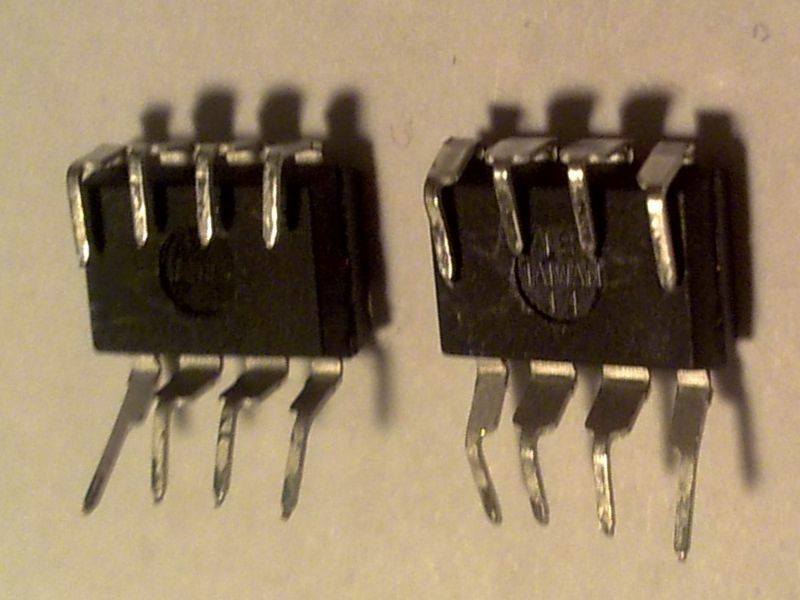 The first round of QRSS keyer chips, I packaged in short cuts of the plastic chip tubs that integrated circuits are often supplied in, then put these into a normal white envelope. Unfortunately one recipient reported back that his envelope had arrived torn in half, with a humble letter of apology from the Royal Mail, but nevertheless no QRSS Keyer chip inside. Presumably the bulge in the middle of the envelope must have caused it to get caught in some piece of Royal Mail machinery in some sorting office somewhere. Another recipient reported that his was fine, except that he'd had to go to his local sorting office to collect it, and pay a postage surcharge because the applied 1'st class stamp was deemed insufficient. I should explain that in the UK, a standard letter is defined as no bigger than A5-sized, and no more than 5mm thick. Any bigger than that, and one must buy a more expensive "Large" stamp. 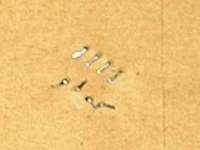 Definitely the bulge in the middle of those envelopes was more than 5mm. So the next round of QRSS keyer chips, I packaged differently. This time I wrapped them in foil and stuck them to a piece of paper, then put that into a more industrial style of stronger-looking brown envelope. Now unfortunately several people gave feedback about the Royal Mail having converted the chips into Surface Mount Devices! I learn something new every day: now I know that the Royal Mail put all their mail under a steam roller in the sorting offices. Some work with the pliers could unbend the chip pins, so I am told. See below for some photos of the result (Left: Dave G8XUL; Middle, Right: Charles G3OTH). The chips are now sent in nice padded Jiffy-bag envelopes, and use the chip tubes, see the online shop.